Announcing the 2018 mini-grant winners! 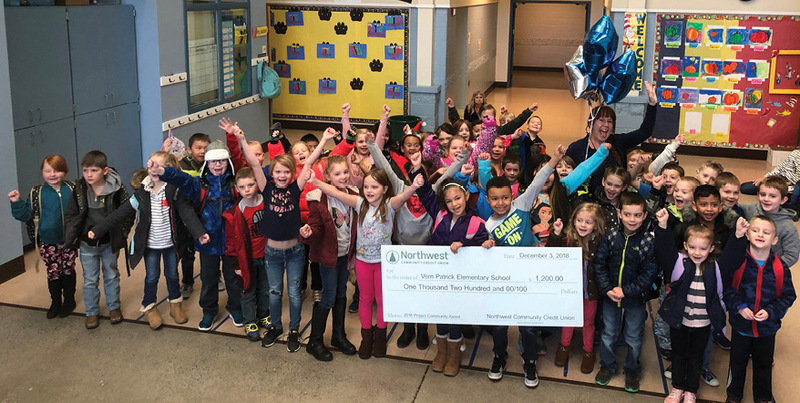 Project Community is Northwest Community Credit Union’s mini-grant program supporting Oregon teachers. Project Community provides funding to help teachers with tools and resources they need to create meaningful learning experiences for their students. Once our 2018 deliveries are completed, Project Community will have awarded over $224,000 in funding. 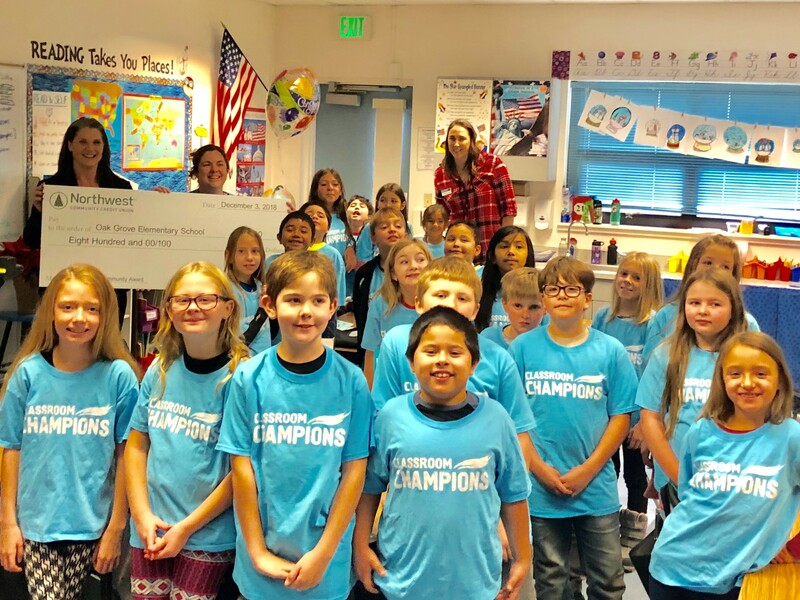 This year, we're delivering $60,000 to 66 Oregon educators! Albany Christian School. Lisa Moore is purchasing birding supplies for her first graders’ science units and hands-on math supplies like geometric tiles. Albany Christian School. Ruth Wilke is using her grant to purchase a listening center to support her second graders’ literacy. North Albany Elementary School. Megan Louber will be buying oil pastels to promote creative and critical thinking skills. North Albany Elementary School. Stacey Morris’ grant will be put towards a Magnatile set to create STEM challenges for students. West Albany High School. Jodi Howell is purchasing 75 new novels for her AP Composition class. Amity Creek Magnet School. Wendy Pierce is using her grant to invest in school garden kits to create vertical, edible plants for an outdoor classroom. Pilot Butte Middle School. Ryan Goldstein is using his grant to purchase cameras for seventh and eight graders to use in film and journalism classes. Illinois Valley High School. Megan Brown is using her funding to replace the school’s novel sets. Central Point Elementary School. Candey Lee will use her Project Community grant purchase oil pastels, canvases, mason jars, mosaic tiles, water color paints, and more to expand her art class materials. Blossom Gulch Elementary School. Nicole Ault, Dayna Inskeep, Lauren Chan, Amelia Edd, Misty Howerton, and Jennifer Easton will use their Project Community award to purchase Read and Sing Big books for the entire first grade to improve reading. Blossom Gulch Elementary School. Amelia Edd will buy book publishing supplies to allow her students to publish books on the subject of their choice. Blossom Gulch Elementary School. Jody Saveland’s funding will purchase ink and Play Dough stamps and an easel to help students get a hands-on experience with words. Millicoma Intermediate School. Jason Goodson will use his mini-grant to buy maps and geography curriculum. Coquille Valley Elementary School. Julia Scolari will use her Project Community grant to purchase a classroom set of current atlases and a globe. Cottage Grove High School. Ricardo Florez will purchase new headphones for his computer lab so students can access college-level classes. Cottage Grove High School. Sheila Ghelfi will be using her Project Community funding to purchase Chromebooks for students in special education classrooms. Harrison Elementary School. Sarah Parsons will be purchasing listening centers and CD book sets to help kindergarten students with literacy. Lincoln Middle School. Lisa Sherman is using her grant to purchase books for students with reading disabilities. London Elementary School. Bill Bechen is using his funding to buy curriculum to teach kids handwriting proficiency. Dorena Elementary School. David Ghelfi is purchasing new Chromebooks that will be compatible with his school’s 3D printer. Awbrey Park Elementary School. Katy McGuire will use her grant to purchase an alphabet carpet to enhance classroom management and the ABC for her first grade class. Awbrey Park Elementary School. Stacie Yarbro will build purchase percussion instruments for her music classroom. Cal Young Middle School. Ginger Topize will use her Project Community award to purchase individual and team white boards and accessories to help students in assessments and groups. Crow Middle/High School. Michelle Kau is using her funds to purchase Chromebooks and scientific calculators. Danebo Elementary School. Crystal Strege will be purchasing Chromebooks and licenses for students. Fairfield Elementary School. Talor Kirk is using Project Community funding to buy Lego educational sets and Chromebooks to allow first grade students to access lessons and STEM opportunities. Meadow View School. Kim Saisslin is using her grant to purchase alphabet curriculum sets to help students improve reading skills. Prairie Mountain School. Jessika Smith is expanding her class’ musical library with guitars, bucket drums, and Boomwhackers for fifth through eighth graders. Glide High School. Jennifer Clair’s Project Community award will purchase new young adult books for her reading classes. Allen Dale School. Sandi Willett will use her Project Community funding to buy Chromebooks and licenses. Hidden Valley High School. James Powers' funding will purchase graphing calculators for his math students. North Valley HIgh School. Brian Scharpen is using his award to purchase access to the Knowledge Matters program, teaching students about starting digital businesses. Oaklea Middle School. Aaron Thorton will use his Project Community funds to purchase Chromebooks for math students in seventh and eighth grade. Central Medford High School. Julimarie Thomas will purchase djembe drums for her music class. Hedrick Middle School. Zachary Miles will buy individual dry erase boards and markers for his math students. Jefferson Elementary School. Katherine Altheide will use her Project Community award for Boogie Board eWriters. Oak Grove Elementary School. Ashley Anderson’s funding will purchase clipboards, Cuisenaire rods, and math books for third grade students. Hillcrest Elementary School. Lisa Harnden will purchase a book series to help teach her biography unit. Oakland Elementary School. Jessica Hervey is using her funding to buy 250 new leveled reading books for first grade students. Candy Lane Elementary School. Ewa Bleszinski’s mini-grant will purchase books and materials to help with writing skills. Holcomb Elementary School. Kristin Ventura-Stein will use her Project Community grant to purchase science supplies for co-teaching English language learners. John McLoughlin Elementary School. Kathleen Law’s funding will purchase multisensory reading and speaking materials for her students, particularly those with dyslexia. Ogden Middle School. 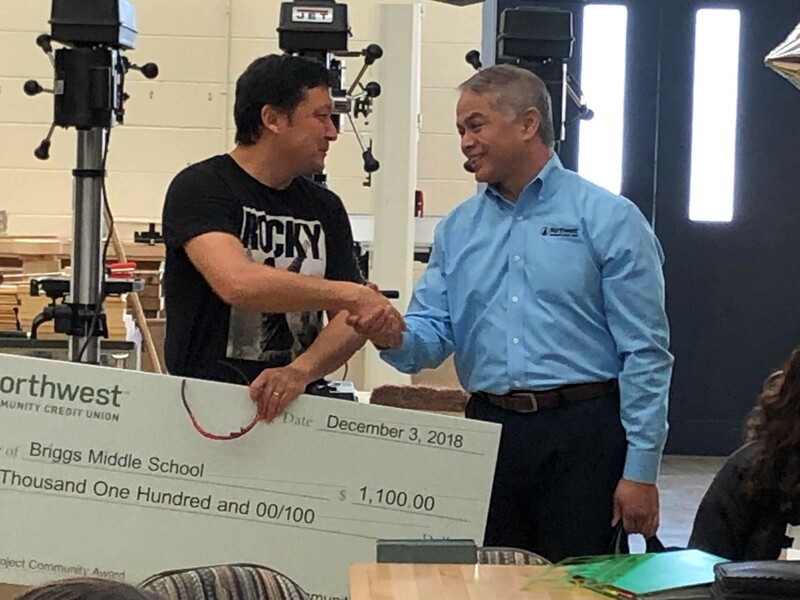 William Coltrin’s Project Community funding will purchase a machine to teach advanced design skills to woodshop students. Jennings Lodge Elementary School. Philippa Hill will use her mini-grant to buy Spanish language books for their school library to support the school’s Spanish immersion goals. Creative Science School. Katie Longstreth will purchase Chromebooks and a charging station for her school’s computer lab. Harrison Park School. Tim Schulze’s Project Community award will enable his students to go to Sauvie Island to learn about science by visiting nature and farms. Parkrose School District. Heather Block will purchase materials to strengthen writing skills for students in occupational therapy. H. B. Lee Middle School. Sunil Schauffler’s grant will purchase comic books for special education students. M.A. Lynch Elementary School. Natalie Richards will be buying Lego robotics kits for students from second to fifth grades. Redmond High School. Rachel Sarrett is investing in writing instruction books, interactive notebooks, and writing utensils to develop writing skills for her high school students. Vern Patrick Elementary School. 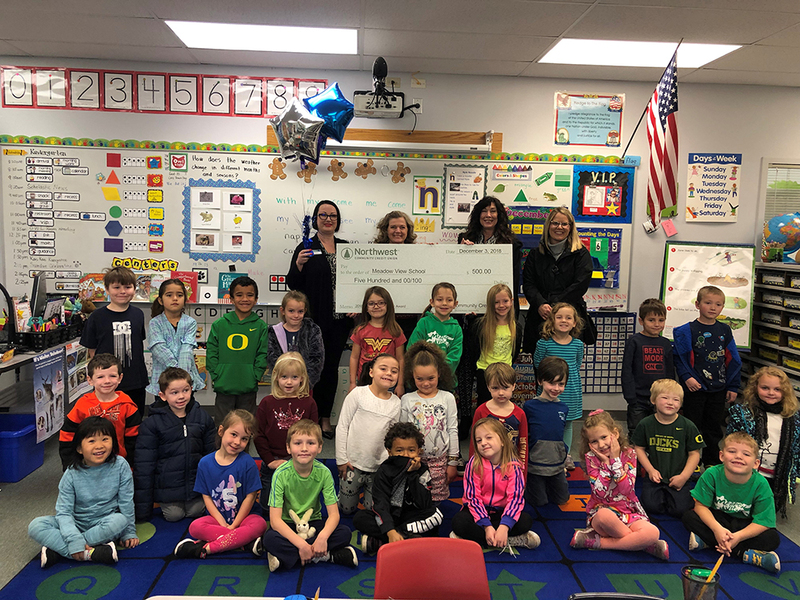 Chersti Thomack was granted funds to create a STEM station for first graders that includes kits that encourage problem-solving and engineering skills. Fir Grove Elementary School. Bridget Batsch’s Project Community funding will purchase medicine balls for her PE class. Fir Grove Elementary School. Dani Rocco will purchase science kits to give her kindergarten class a hands-on experience with scientific concepts. Fremont Middle School. Kari Taggart’s grant will purchase microscopes for her sixth grade science students. Fullerton Elementary School. Alishea Linderman will use her funding to purchase sensory tables to help her kindergarten students develop motor, communication, and cognitive skills. Green Elementary School. Jamie Hummel will buy volleyball, pickle ball, and badminton sets for her PE classes. Roseburg High School. Patti Sperry will purchase 75 copies of Shakespeare’s Macbeth books to supplement the supply for her English class. Agnes Steward Middle School. Sarah Heacox-Jackson will buy a 3D printer and materials to teach modeling for seventh grade math students. Briggs Middle School. Amy Brooks will use specialized white boards to facilitate small group learning stations in math. Briggs Middle School. Joe Hass will use two new high quality cameras with accessories for Art & STEM classes, as well as Yearbook. Elizabeth Page Elementary School. Debra Pennicott’s Project Community funding will purchase a physical education curriculum for third through fifth graders. Hamlin Middle School. Zack Allen’s award will purchase technical education gear for kits to teach his students about household electrical wiring. Hamlin Middle School. Jennifer Backer will use her grant to purchase cooking tools that will teach students how to cook meals for themselves. Springfield High School. Shelley Power will purchase book sets for special education English classes. Thurston High School. Allix Baker’s funding will buy dissection specimens for anatomy and physiology students. Sutherlin East Primary School. Lori Solberg’s Project Community grant will purchase breakout boxes to make reviewing and applying lessons easier.